The scheme will cover widows and divorced women as well. 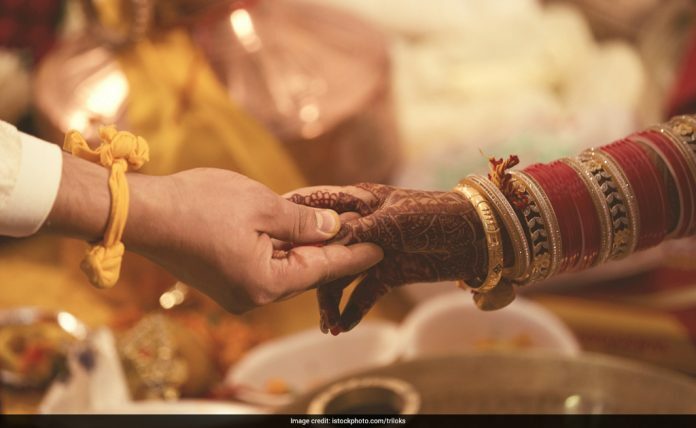 Lucknow: The Uttar Pradesh government on Tuesday approved the ‘Mukhyamantri Samoohik Vivaah Yojana’, a mass marriage scheme, wherein Rs 35,000 will be spent on each couple, besides gifting them mobile phones and household items. “Under the scheme, mass marriages will be conducted by the social welfare department. Programmes in this regard will be organised by urban local bodies like nagar panchayat, nagar palika and nagar nigam, kshetra panchayats, zila panchayats, government/semi-government organisations and NGOs, which will be authorised by district magistrates of respective districts,” said state minister Sidhartha Nath Singh. He said parents of the brides have to be residents of Uttar Pradesh and should be from below poverty line to avail the scheme. “There should be at least 10 couples in the mass marriage ceremony. An amount of Rs 35,000 will be spent on each couple. A number of household items and mobile phones will be given as gifts to the couples. The scheme will cover widows and divorced women as well,” the minister said. The state cabinet also approved draft of The Uttar Pradesh Aadhaar (Targeted Delivery of Financial and Other Subsidies, Benefits and Services) Bill-2017. The Uttar Pradesh government also announced a new scheme for school students. Under the programme, a pair of shoes (one set), a pair of socks (two sets) and a sweater will be given to students of government primary (class 1 to 5) and upper primary (6-8) schools. The step will benefit 1,48,49,145 students (more than 1.48 crore). The cost of a pair of shoes comes out to be Rs 135.75, while the cost of a pair of socks is Rs 21.85, Mr Singh added.